Project goal: developing a new method based on HPCN (High Performance Computing Network ) to validate numerical models using statistic correlation with experimental results. This correlation is based on Montecarlo techniques, available at the moment in PROMENVIR project. 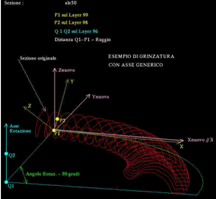 It permits a high flexibility with regard to the use of numerical simulation codes. Project goal: development of a software tool for automating the design of a rubber manufact in the automotive industry (especially a door packing). Project goal: use of numerical multi-body simulation in addition to experimental tests on a scaled prototype of a railway bogie as a Design Method during the development stage of a new bogie.